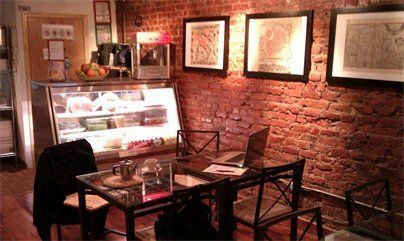 Go to the Lower East Side and walk down Houston Street between Norfolk and Suffolk to a modest basement cafÃ© called Gaia. Now. It's been open since February and is so inconspicuous it's escaped most people's notice, but it can't stay that way for long. Gaia Bagnasacco, the owner/chef/baker/waitress/cashier/dishwasher, is from Milan and instinctively knows how to make amazing, bargain-priced salads, pasta and panini. At our first dinner we split a big arugula salad with pesto dressing and cherry tomatoes, followed by pasta richly flavored with shrimp, mushrooms and herbs and two savory, flaky, buttery pastries filled with mascarpone cheese and spicy coppa (cured pork neck) and the entire bill came to $23 (it's BYOB). Gaia was running the whole show, in jeans and a baseball cap turned backwards, and even though she must have been going crazy, she took the time to be nice and even instructed us in basic Italian. I was relieved on my second visit to find her cousin from Milan helping out with the workload. My $5 panini was fabulous, made with thin, crisp herb bread Gaia bakes herself, spread with mustard and stuffed with prosciutto, mozzarella, tomato and anchovies. During the day the brightly-lit cafÃ© is filled with neighborhood artists and musicians but if you want to go at night, call ahead. Gaia gets tired and has to go home sometimes.